At UTSA, Myron Anderson will help shape policies, set goals and provide strategic direction to cultivate a spirit of collaboration and an inclusive campus environment. (Nov. 9, 2018) -- As UTSA implements its strategic vision and further cultivates a campus atmosphere that embraces diversity and inclusion, President Taylor Eighmy today announced the selection of Myron Anderson as the university’s Vice President for Inclusive Excellence. In this founding position, Anderson will serve as a leadership anchor, helping UTSA shape policies, set goals and provide strategic direction for the journey toward improving the campus climate for underrepresented groups. 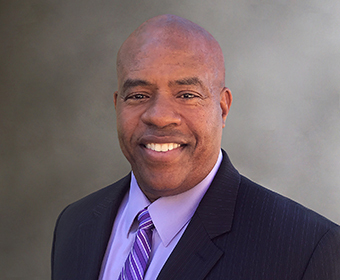 Anderson joins UTSA from Metropolitan State University of Denver (MSU Denver), where he has served in various roles since 2004 and currently serves as the Associate to the President for Diversity. He brings to UTSA more than 25 years of professional experience in higher education, including time as a faculty member conducting research in education technology. At MSU Denver, Anderson is currently responsible for developing an inclusive campus, and articulating and resolving current and anticipated issues related to campus climate, diversity and inclusion. In addition, Anderson identifies campus climate trends and is responsible for developing a strategic vision across all academic and administrative units to establish strategies for resolution of campus climate issues. At MSU Denver, Anderson has led the development of innovative recruitment and retention programs and the systemic implementation of a university-wide Campus Climate Survey, contributing to improvement of the campus climate and a 35 percent increase in the retention of faculty of color. His leadership has also led to the increase of faculty of color by more than 50 percent since 2005 with a university workforce greater than 30 percent of color. Additionally, he’s raised and managed millions of dollars in an effort to align the MSU Denver mission with regional and national constituent goals and objectives. As a result of Anderson’s focus on inclusive excellence, MSU Denver is a five-time recipient of the Higher Education Excellence in Diversity award and has received the Diversity Champion award three times, which recognizes the top 15 colleges and universities in the nation that exemplify an unyielding commitment to diversity and inclusion throughout their campus communities, across academic programs and at the highest administrative levels. Anderson has also conducted research in instructional technology, distance education, campus climate, diversity and microaggressions in higher education. His academic achievements have earned him tenure and the rank of full professor at MSU Denver. As UTSA Vice President for Inclusive Excellence, Anderson will provide leadership in the development, coordination and implementation of initiatives that contribute toward establishing an effective and collaborative policy and practice of diversity, equity and inclusion. Prior to his current position, Anderson served as associate chair of the Teacher Education Department at MSU Denver and as program leader in Continuing Education and director of student services at Virginia Tech and Winston-Salem State University, respectively. Throughout his career, Anderson has been cited by more than a dozen publications, served on many university and community committees and panels and has been a member of more than 20 professional organizations. President Eighmy created the Vice President for Inclusive Excellence following input from a UTSA faculty and staff diversity survey last fall, as well as feedback he received during community conversions sessions earlier this year. UTSA launched a national search in June with the appointment of a broadly representative search committee chaired by Interim Vice President for Student Success Rhonda Gonzales. The UTSA community also attended open forums in September to hear from the finalists. Anderson begins his new role at UTSA on Jan. 1, 2019.